Blackpool's Brad Potts was affected by a family bereavement over the festive period, says boss Neil McDonald. The midfielder, 21, scored twice as the Tangerines beat Scunthorpe 5-0 on Saturday, taking his tally up to five goals so far this season. Potts joined for a compensation fee from Carlisle last summer. "He's owed us a good performance as he's been off-colour for the past couple of games," McDonald told BBC Radio Lancashire. "Nothing was really said before Christmas - he's had a very, very close relative die and it's been a tough time for him. "He's come through that now excellently. We supported him all the way and we've got a tremendous performance out of him with two goals, which is an extra bonus." 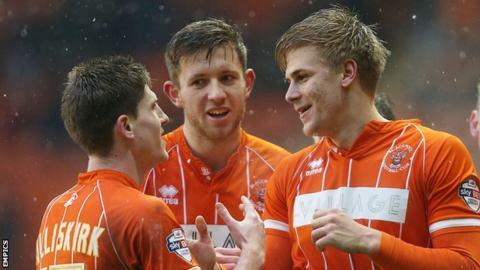 The victory moved the Seasiders out of the relegation zone and was their biggest win since they beat Ipswich 6-0 in August 2012. "I think that's the best we've played all season," added McDonald. "We've created chances and this time we've put the chances in the back of the net. "It's been a great day, scoring lots of goals and keeping a clean sheet, which is excellent."